I am Francesca mother of Alice and wife of Francesco, I live and work at Siena as a freelance architect and I've put all my soul in this house. The house belongs to my family from 1960 but at the time, it was a hayloft. My father, who was an engineer, had the dream to build his studio. He died when I was 19, without accomplishing his dream. Therefore, I signed myself into the architecture school of Florence, and as soon as I graduated, I renovated the hut trying to shape that dream, into reality. I have lived in this house for 6 beautiful years, until 2009, when my princess Alice was born and I decided to move near my mother, since my husband had a restaurant and was never at home. Since then, I rent the house to my guests, I always try to make them feel at home and try to pass onto them the great passion that connects me to this place. I believe that renting the hut is the best way of keeping the place efficient, beautiful, and take care of it year round, trying to share what this magical place has to offer. Great privacy but not isolated, panoramic, with breath-taking views on the vineyards and the Chianti hills, extremely quiet and filled with peace. Very close to the historical centre and all the amenities, equipped with all commodities. From here, numerous paths to explore Chianti start, either on foot or bicycle. It offers the possibility to organize events such as birthdays, weddings, baptisms, thanks to its large garden, but also cooking courses and much more. I am available for the guests to organize any type of tour, either eno-gastronomic (wine tour), or any art and culture trip, exploring the neighbour cities like Pienza, Montepulciano, Montalcino, private and exclusive visits to wineries, where you can find the owner personally that will show you the process of the wine production, cooking courses, personal trainer on site and much more. Typical Tuscan diners can be organized at home, guided tasting tours, if you would like to find your grocery shopping at home, please send us your list and we will deliver it to the house upon your arrival. I cannot say enough about Francesca, her home, her hospitality and the amazing tour and meal she provided us! I highly recommend anyone traveling to Siena to stay at this property and to arrange tours with her. From the warm greeting to the hugs goodbye, everything we encountered with her was exactly what we imagined Italy to be. We loved our recent stay in Siena with Francesca as our host. We had a party of 3 adults and the house had plenty of space for us. We used the fireplace to keep the place warm and cozy and we made a few of our own meals in the fully equipped kitchen. We were welcomed by a gift basket with some necessities. We were especially happy to see the house had an American Coffee maker and the gift basket included some ground American style coffee!!! Both hard to find in Italy!!! Francesca and her husband Francesco entertained us twice for dinner during our 8 night stay. Both were great evenings - something I would highly recommend. We also took advantage of the car rental and a number of tours from our host Francesca. She was a great tour guide and well worth the price we paid. Her English was great and we loved the tours -- I would use her again no questions. Overall the Villa and the optional Car Rental, Dinners, and Tours provided by Francesca were a key part of our amazing Tuscany vacation. Francesca and Francesco Grazie Mille!! Your home is very special. The views from the yard & hot tub area are amazing. What a way to wake up in the morning. The homes central location made it easy to get to all the hill towns, vineyards, and restaurants. We never drove more the 1 hour to get to the places we wanted to visit. It was perfect. The small neighborhood is very quiet and safe. We really liked the automated gate at the homes entry. The hot tub was fantastic we used it several times, even in the rain/fog! The kitchen had all the gadgets and place settings to make meals for a family of 16! The fireplace was easy to use and the living room is large enough to gather and watch the fire and relax. We were also glad to have a washer and dryer. Francesca made the arrangements to have a private chef come cook for our family on the evening we arrived. The 3 course meal and wine pairing promised turned into a 5 course meal with 4 types of wine, vin santo, & home made limoncello. I will say that was the best meal we had all trip. True Tuscan cooking! Thank you so much for making our Thanksgiving trip a success. It was a pleasure to meet you and your group and to be of any help is always a pleasure too. Wonderful surroundings and views the hose has all you need!! We spent 8 nights at this beautiful, quiet villa, which was a short drive to the local grocery market as well as the old town of Siena. Our hosts, Francesca and Francesco provided us with a rental car, a cooking class one evening at the villa, a full day tour of old Siena, and a full day tour of 2 winery's in the area. They also provided local suggestions for restaurants and other interesting sights in the area. Their hospitality was over the top. The villa setting is in a very quiet area with a wonderful view of vineyards and olive groves, was very clean on our arrival, and all amenities were as described in the listing. The accommodations were perfect for 2 couples, but can accommodate 3 couples. 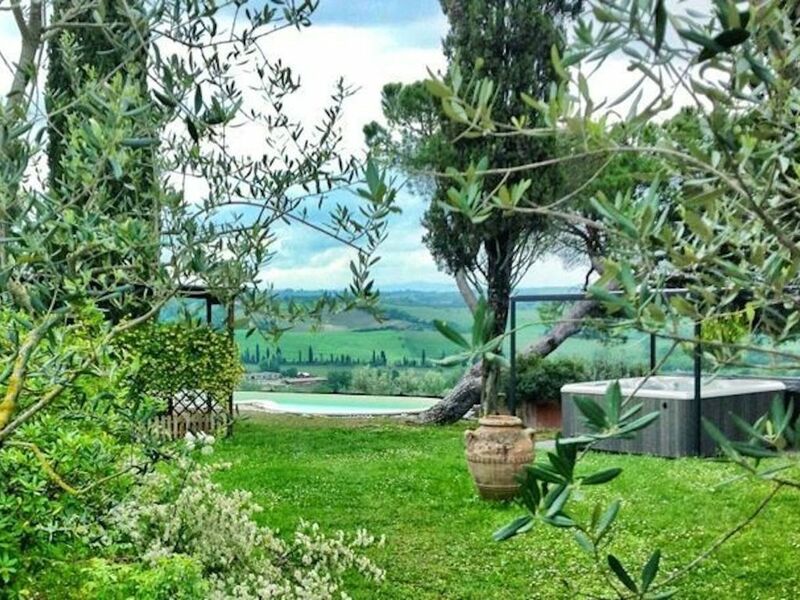 We definitely recommend this villa for your stay in Siena as well as the rental car, tours, and activities offered by the host. We consider Francesca and Francesco our friends, as they made our stay in Siena very special. My husband and I love Tuscany and were very excited to stay at the villa with our two sons (3 years and 4 months) and my parents. The view was amazing and the location was perfect. - even though we did a long list of food to have on our arrival (as required on our booking form) there was nothing at the house. Not even a bottle of welcone wine. A real let down for the price and very inconvenient when you have traveled all day and just want to relax but you have to treck to the supermarket. Overall this villa is lovely. The host is nice and she did help us out with armbands for my son (we forgot ours). We just dont think its worth the high price tag. A few hundred less and we would go back. Despite my personal intention of giving the equivalent service of a 4 star hotel, even if it is only a Tuscan Villa for rentals and not a hotel. When you arrived, apart from what my villa can offer ie. a panoramic swimming pool, an external Jacuzzi and indoors, A/C, washing machine, dryer and washing up machine etc. £ external loggia's for you to relax in, reading, dining with a barbecue and wooden oven, which I feel can more than justify our pricing in comparison to basic villa's with no service or extras. I also always include all soaps and conditioners in the bathroom plus soaps for the washing machine and washing up machine. Loo paper, bedroom slippers, umbrellas in case of rain. Oil and vinegar in the kitchen including all basics ie sugar, coffee, dried herbs, pasta, which I personally offer as a little 'welcome' to all my guests which in my humble opinion is much more helpful and welcoming than just a bottle of wine, avoiding having to go out and do the minimum shopping upon arrival. I am sorry that you found the sofa uncomfortable despite it being a only 5 years old and of original design, I am also an architect and believe I can understand a bit about this , for obvious reasons and your are the only person so far that has found it uncomfortable, my apologies. Perhaps the real problem was that I had promised to do your shopping when you booked a year ahead of time, knowing that you had a small child and were worried about this. I offered this extra service as I understand how difficult it can be with small babies, but as a whole year had gone by unfortunately it had slipped my mind, but my first instinct was to offer to go and do it immediately for you, but you replied that your husband had already gone to do the weeks shopping. Perhaps it would have been helpful to have a reminder from you, I am so sorry this upset you so much. I always offer my total availabilty to my clients, booking you various taxis even at 10pm and I am sure you are aware this is more of a concierge service than a simple villa rental. I rushed off to buy arm bands for your son to go swimming. I did my utmost best to give you a top star quality stay but am very surprised that despite all my troubles you did not feel satisfied and sent in such a negative complaint. The hut is located at the gates of the city of Siena and on the slopes of Chianti, at 3 minutes from the Siena-Florence junction, 5 min by car from the historical centre of Siena. It is ideal for whoever that wants to visit the historic town or take a tour to the historical city of San Gimignano, Montalcino, Monteriggioni, Pienza, Montepulciano, and many more.